Anthony Woodburn deals in fine antique clocks - 17th & 18th century English antique bracket clocks, longcase clocks and antique barometers, including pieces by JOSEPH KNIBB, Londini Fecit . A fine, rare and well conserved Charles II quarter repeating spring table clock in a particularly small ‘phase III’ ebony and gilt metal mounted case surmounted by a foliate tied gilt metal handle to the cushion top. The matching escutcheons to either side of the front door are typically Knibb with cherub and wings. The brass dial and winged and cherub spandrels retain their original fire gilt. The hands are delicately pierced and facetted. The quarter repeating mechanism is operable from either side of the case and the eight-day duration movement includes a verge escapement and a finely engraved backplate in the early style of tulips and foliage and the maker’s signature signed in a crescent. 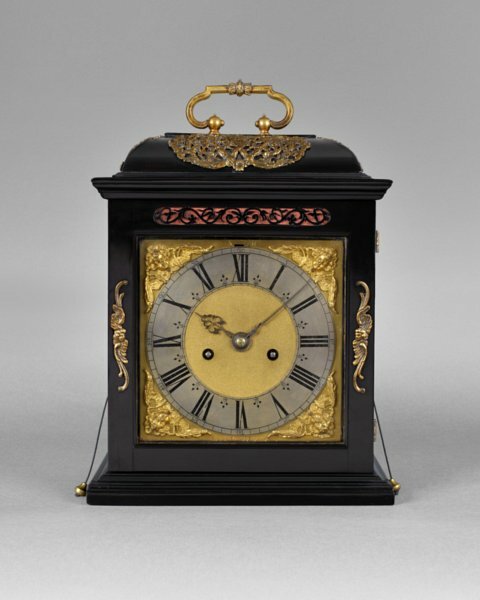 Unusually, this clock stands only 11 ½ inches high (29.5 cm), excluding handle. Joseph Knibb was born in 1640 in Oxford. In 1668 he was given Freedom of the City. To begin with he worked with his brother John in Oxford before moving to London c1672 where he supplied clocks to Charles II and established himself alongside Thomas Tompion as one of the principal clockmakers of the last quarter of the 17th century.